It is designed to primarily compete with Jolly Manor, The Pratt, Grossman Apartments, Graham Apartments and, if the Rush Hour Expansion Pack is installed, Beigestone Hi-Rise. 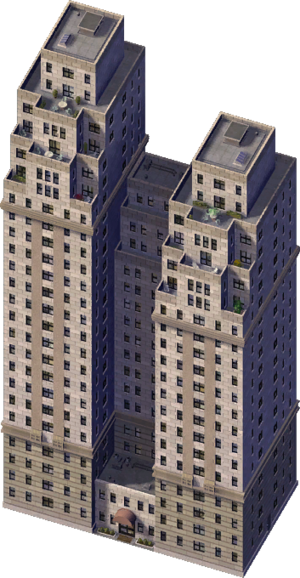 Simon Manor was clearly based on 895 Park Avenue in Manhattan, New York City. The only real difference in the Recreation is that the two towers' heights differ. This page was last modified on 9 May 2015, at 10:58.